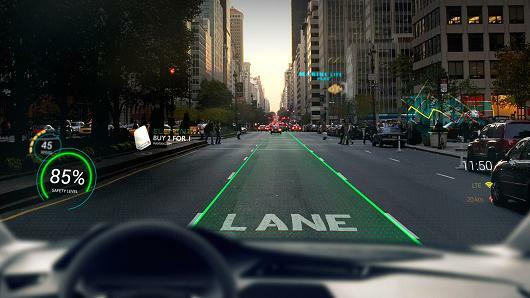 WayRay makes augmented reality hardware and software for cars and drivers. The company won a start-up competition at the Los Angeles Auto Show. 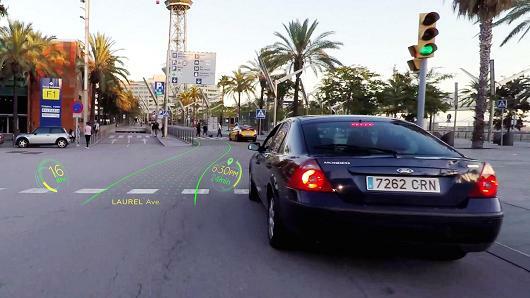 WayRay's augmented reality driving system makes a car's windshield look like a video game. The Swiss-based company that makes augmented reality for cars won the grand prize in a start-up competition at the Los Angeles Auto Show on Tuesday. WayRay makes a small device called Navion, which projects a virtual dashboard onto a driver's windshield. The software can display information on speed, time of day, or even arrows and other graphics that can help the driver navigate, avoid hazards, and warn of dangers ahead, such as pedestrians. WayRay says that by displaying information directly on the windshield, the system allows drivers to stay better focused on the road. The display might appear similar to what a player would see on a screen in many video games. But the system also notifies the driver of potential points of interest along a route such as restaurants or other businesses. On Tuesday, the start-up took the top honor in the 2017 Top Ten Automotive Startups Competition on at the Los Angeles Auto Show's AutoMobility LA trade show. WayRay beat nine other contestants drawn from a pool of 300 applications. The panel judges included AutoMobility executives from the LA Auto Show executive team, Microsoft, Nvidia, Porsche Consulting, Sansea Consulting, and Time Inc.'s The Drive. The company edged out the other two finalists for the prize: Ohio-based GhostWave, which makes radar for advanced driver assistance systems, and Israel-based Innoviz Technologies, which makes lidar, a technology thought to be crucial to self-driving cars that uses lasers to create images of environments and objects. The award included $15,000 in prize money and several other perks. Microsoft offered $40,000 worth of cloud storage on their Azure cloud and consulting services. Nvidia gave the company one of its new Nvidia Drive PX 2 AI car computing platforms, which the company has said holds enough computing power to enable full self-driving capability. Source: Ferris, Robert. (2017, November 28). “Alibaba-backed augmented reality start-up makes driving look like a video game”. CNBC.